I'm actually missing the Nanman part in the new series and the Yellow Turban part in both series. It's a pity they didn't care to make it. Zorkaz wrote: I'm actually missing the Nanman part in the new series and the Yellow Turban part in both series. It's a pity they didn't care to make it. The actors braved the summer heat and filmed in "tin cans" and if they had to do the Nanman part, it will mean surviving tropical heat and mosquitoes??? Have pity on them!! The whole Nanman story to me is another Zhuge Liang propaganda. To film it will take even more focus away from the somewhat neglected Wu or Wei storyline. Yet, the ending itself is already very rushed. It felt like the filming crew got sick of the story after Zhuge Liang died and decided Three Kingdoms should also end with his death. Starscream wrote: The actors braved the summer heat and filmed in "tin cans" and if they had to do the Nanman part, it will mean surviving tropical heat and mosquitoes??? Have pity on them!! Aren't they supposed to be professionals? Jolt wrote: Aren't they supposed to be professionals? Professionals, and humans, like anyone of us. @JessicaLeung Yeah, that part was way better in the old version Actually anything Zhuge Kongming related. What I miss from both series is the Yellow Turban Rebellion. It might have been a bit boring in the 2010 version, but it should have been mentioned. I mean it was an important part of Han Dynasty and one of the biggest peasant rebellions in history. Zhuanyong wrote: Yunchang had an excuse. 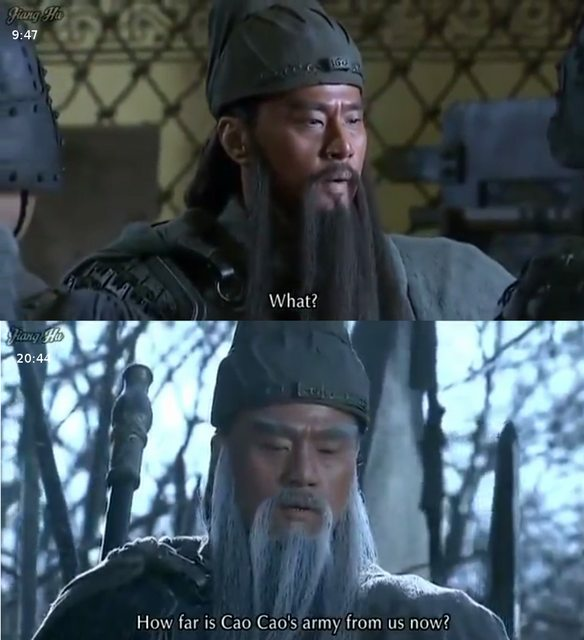 He was shocked by the sheer power that Xu Huang displayed in his strike and his utter uselessness to defend against Wei. Then the fact that he was running for his life from Lu Meng had him despair into going grey. This may be a romanticized tale, but I still found it rather silly. Kind of killed the mood for me. Luckily it didn't last, as the next episode moved right onto to Cao Wei's own tale of heartbreak. It's been a few years since I've seen this, but I remember this show was pretty successful in butchering Lord Guan's character. I think Zhang Fei was nice, he just looks as I imagined him, when reading the novel. Of course the historical Zhang Fei is totally different.